Music Midtown, Atlanta’s renowned music festival that draws talent from around the world, returned this year for its fifteenth installment, on Sept. 19 & 20 at Piedmont Park, with popular indie and mainstream artists from various genres. Lineups of years past included all-stars such as the Arctic Monkeys, the Yeah Yeah Yeahs, Coldplay, the Red Hot Chili Peppers and the Foo Fighters. With so much talent and experience to live up to, this year’s lineup was expected to have a stacked roster. Big names that landed spots this year included Eminem, Lorde, Lana Del Rey, Iggy Azalea, Bastille and John Mayer. Other equally well-know albeit less current performers were Run DMC, Jack White, B.O.B, Third Eye Blind, Gregg Allman and Fitz and the Tantrums. Rounding off the talent this year were several up-and-coming acts that may not have the massive fan base of some of the more popular superstar names, but that didn’t stop them from pulling off more than a few impressive performances. These acts included Banks, Bear Hands, Sleeper Agent, Magic Man and the Strypes, among others. Three stages, a couple dozen acts and over 75,000 fans added up to two days and nights of crowded fields, expensive vendors and, of course, stellar music. As with any massive event, there were a number of pros and cons worth discussing; this festival is one of Atlanta’s great pride and joys, so every year should be a vast improvement from the last. As a music festival goes, this event attains exceedingly high marks. Eminem is a hip hop icon, Lorde is one of the biggest players in the game and John Mayer is an undoubted crowd favorite for many locals. This festival is not recognized on the national or international scale like Austin City Limits, SXSW or Coachella, yet it manages to maintain the same high-quality lineup. As local events go, there is not much out there that can compete. Every artist played with high energy and enthusiasm, which carried over to the vast sea of fans and created a palpable atmosphere of musical passion. Atlantan’s came with a shared love for the music and they were rewarded with correspondingly great performances. The event organizers and production crews also kept all the technicalities running without a single major hiccup. This kept artists confident and anxious crowds relaxed. Performance after performance went on with great success and matched fans’ expectations. There were no Cake incidents like last year, for those who recall their extended monologue and lack of an actual show. The only artist that had a questionable show was Lana Del Rey. After she cancelled her European tour due to illness, fans were unsure whether or not she would maintain a strong stage-presence. While she commanded a Christ-like focus from her most passionate fans, she had some small sound issues and displayed no gravitas to sway the remaining attendees. However, while her performance was a bit lacking in energy and variety, Del Rey was perhaps one of the most interactive acts of the entire festival; after ending her final song, the singer spent nearly half an hour simply walking and talking amongst her fans, taking pictures and showing off the human side that undoubtedly contributes to her growing fan base with each performance. Ironically, most of the downsides of the music festival actually had nothing to do with the music, but rather with the conditions of the location itself. The post-summer heat, although not horrible, tended to become a bother during the crowded times leading up to each performance, and health essentials such as water were either costly or in short supply. Another major health hazard was the fact that the crowds themselves were massive, and unnavigable as a result. First aid tents were of course spaced throughout the park, but anyone in need of them first had to swim through an ocean of slightly drunk and irritated superfans. Additionally, any fans who wanted even the slightest chance of getting close to their favorite acts had to line up nearly an hour before the performance in question, causing them to miss other performances despite the equally spaced structure of the lineup schedule. Of course, such problems occur in any music festivals of this caliber, but the fact that the crowds at Music Midtown are expanding exponentially each year cannot be avoided; the festival may need to expand into other areas of Piedmont in the future if they want to accommodate the growing numbers. If such an expansion does occur, amenities such as free water stations would undoubtedly be a smart addition as well, if only for the health hazards that they would prevent. Also, activities and themed events other than the main performances would add a new level of interaction to the festival so it becomes a well rounded experience. 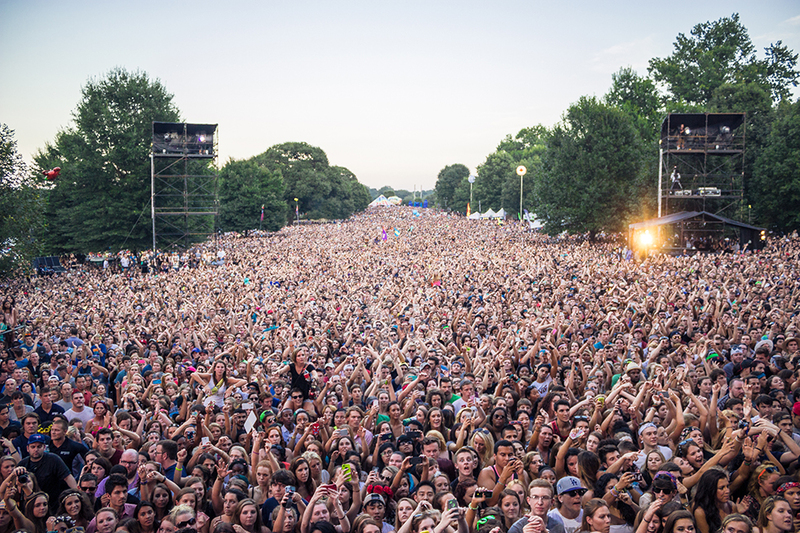 All in all, Music Midtown 2014 rose to the same levels of success achieved by previous years; the acts were dynamic and varied across a wide range of genres, and any technical difficulties encountered during the acts were eclipsed by the relative smoothness of the transitions between artists. Hopefully, future festivals will take advantage of space of Piedmont in order to accommodate the ever-growing crowds, but in the mean time, Music Midtown remains one of the prime examples of what makes Atlanta such a culturally and artistically diverse city.